I've been meaning to publish these pictures for a while now. The photo album in my phone is getting a bit full, so now is the perfect time to unload all of my glittery glamour onto this blog. These photos are a collection of things I have done in my place in Morocco and little doodads and odds and ends of crafty creations. The only exception is the pictures from the former beach house with the light blue walls. Some of you may have seen a few of these pictures elsewhere but I'm putting them up on here anyway. I'm just including these pictures of the Aorir (not Tamraght) beach house because I like how the paint turned out. I didn't have a plan and just went with the flow as I started to paint. I also put up a curtain that I cut out from a sheet. I paid $2.40 for two flat sheets as a set. They were new, too and I just cut it and put it on a curtain rod bought at the souk for around $3.00 I think. AFTER: A little pop of color. The next part is all about cabinets. When I first walked in the new place, I saw these grody, nasty brown wood cabinets and my first words were, "Uh-uh. Noooooo way, man. Not today, not ever. These have to be changed immediately. How gross ARE these? Eww dude." Then I told Mohamed I wanted to paint all the wood in the kitchen (including the window frames, windows, and the wood I hadn't bought yet--but envisioned-- as shelving) to all white. He literally laughed and said, "That's gonna look stupid." I laughed back and said, "HA! We'll see how stupid it looks when I'm all done. So I painted away and turned it from this grimey, grungey, dingey kitchen into a light, bright, cooking space. After: Like 100x better, right?! Mohamed actually said, "Ok, you were totally right. It looks way better now." Thank you, kind sir and please become accustomed to saying the words "you were totally right" as you will be using them often in the future. Haha! The next thing is kind of boring, but it's a good tip if you need kitchen space on a budget. 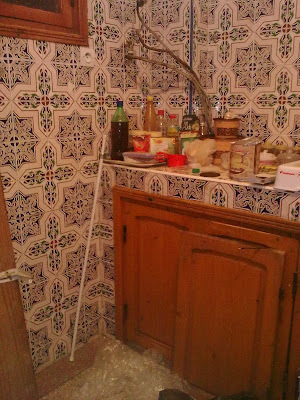 The white pole you see in the picture is actually the lightweight metal tube from the beach house curtain rod. I still had the hardware and mounts with me and as luck would have it, it fit perrrrrfectly where I wanted to hang it. I made my own metal hooks to hang the pots with out of 2 wire coat hangers. I clearly don't travel with a saw, so I just used a smooth-blade fruit knife and cut it. I know, right? Whatever, it worked and didn't take hardly any elbow grease. Don't call me a pot head. Baller on a Budget craft idea # 3,476: The super cool string light. This project was almost free. Sarah gave me some purple yarn and I bought the punching balloon from the souk for 3 dirhams or about $0.35. I wandered into a hardware store and picked up this bucket of Elmers-like glue for about $1.85. The plastic drop-cloth came wrapped on one of my custom canvases so that was free. I blew up the balloon and greased that bad boy with some medical ointment for backaches because I didn't have Crisco. Then I undid the yarn and wound it around my elbow and wrist like an extension cord and dunked it in the bucket of glue. Let me tell you how messy this project is: UMM..AVOID MAKING THIS AT ALL COSTS. It's seriously a big gooey, gluey, gloppy mess. Definitely NOT a kids project. Long story short, I wound the string around the ball, let it harden and then popped the balloon. Scroll down. After I redid the couch and chair, I figured why not try to keep up my streak? Sitting in the basement of Mohamed's mom's house was this horrifyingly ugly chair. It was wood with quite possibly the world's most hideous flower fabric on it. Ever the one to find a glimmer of hope in something ugly, I begged Mohamed to let me have it. He looked at me like I was nuts. With a little convincing, reluctantly agreed and sighed while shaking his head. (Behind him, I was doing a victory dance of course). BEFORE: I don't even want to sit on this. This next project was totally free and took me less than a half hour to do. There's a mirror shop around the corner and they always leave scraps outside, which of course are not garbage if you're an artist. All I did was put tape on a mirror and then painted the sections with paint. When it was dry, I took off the tape. Afterwards I added glitter, too because honestly...everything is better sparkly. It's about as long as a cookie sheet and as wide as your hand. 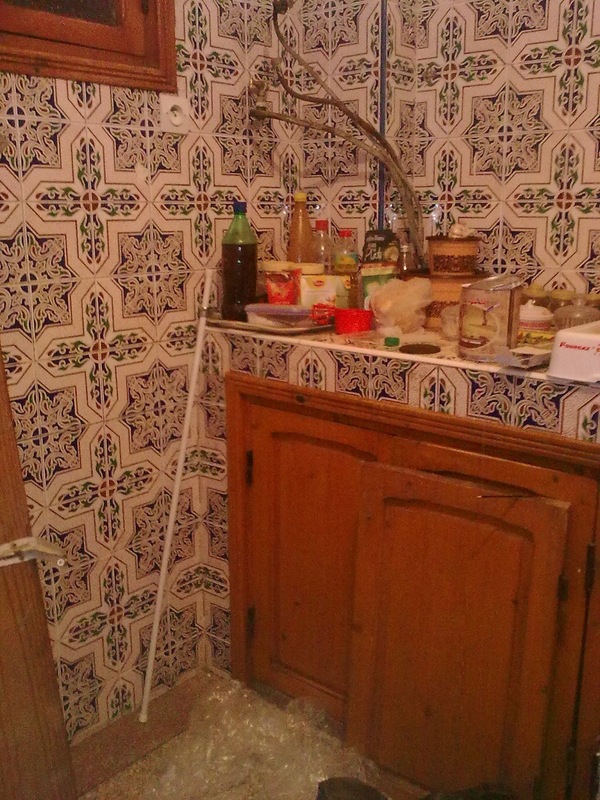 When you move into an apartment in Morocco, all the crud from the tenant before you is still there. Whatever they leave behind is now your responsibility--on top of you having to clean the whole place from top to bottom. Dumb. Anyway, the landlord painted the whole house a really nice buttery color so at least that was fresh. Of course, he left behind his trail of trash, empty soda bottles, and cigarette butts for us to enjoy. Thanks guy! His gigantic paint bucket lid was thiiiiis close to going in the trash until I heroically rescued it at the last second. This is yet another free project for me. I had the paint can lid, some striped tissue paper from my last trip to the dry cleaner, and a black permanent marker. First I painted the lid navy. Then I put a thin layer of glue on it and put the already cut out tissue paper circle on the glue. When it was dry, I sketched a cute little teapot onto it and later filled it in with black permanent marker. Because my obsession with glitter never ends, I decided to outline the edges with silver just to make it pop. Now it hangs on my wall in the tea room! Trash? Not so fast, Bucko! Once again, this was free. It took about 45 seconds. And PS-- this "wine" looking bottle is actually what the first bottle of paint thinner came in. I of course do not drink. The next 2 pictures are of a 4-piece painting I did. On one of our beach trips, I picked up a ton of shells (and even a crab claw!) on the beach. There was an old (typically ugly) frame that I had in mind while I was collecting my beach treasures. It was brown wood with fake gold trim and some even fake-er flowers on the inside. I find it hard to believe that people actually think this kind of decor is even slightly attractive. So I changed it. I painted it all with a sand-colored paint and removed the flowers and junk inside. I took a picture while at the beach and had that printed for about 30 cents. I put the picture in the newly painted frame and glued all kinds of stuff around the edges. Now every time we see this, it reminds of us of a day we spent at the ocean. Cheesy, but true. AFTER: Can you find the crab claw? Ok, so this next one is not technically art but whatever. This is my blog and I'll do what I want. I decided it would be a good idea to give my finger a mustache with henna for the sole purpose of giving Mahmoud a baby mustache. Yeah. Lasted 2 weeks. This one was free, too. (Do you guys see a pattern here?) I took a piece of scrap wood from a kitchen shelf and painted it purple. Then I glued purple glitter scrapbook cardstock to it. I set my free mirror scrap on it and then banged some nails in until it held the mirror in place. I just happened to have purple glitter glue (are you shocked?) so I covered the nails with it to camouflage them. I stuck a peacock feather in there just because it reminds me of my mom. I painted a huge painting of some peacock feathers for the salon. Mohamed was sweet enough to get some canvases custom stretched to the exact size I wanted and I wasted no time in getting to work. The first picture is kind of close up so you can see the inside of the feathers. It looks like they are a swirling navy blue galaxy. I umm...(cue side eyes) added a little navy glitter in the middle only. I seriously have sparkle issues. In the salon, I painted 2 walls peacock blue (which shows up a different color in every picture, none of which is true to life) and one wall is like avocado green. The 3 shelves all have a blue and purple theme and I made everything except the tagine and antique lamp. The middle part has a book holder that was once a bird house and the purple bottle was one I picked up on a trip to Spain. It had juice in it but I painted the inside and stuck peacock feathers in it as you can see. The little polka-dot thing is actually 2 books wrapped in scrapbook paper and sitting atop it are two jars filled with purple sand. The paper on the book holder is cut up articles from an Aer Lingus mag I picked up on a flight to Ireland. Everything is recycled somehow. One of my favorite posts of all time is called "The 7 Day Scramble." (it opens in a new window if you click HERE). If you read it, I talk about how I was on the Marrakech Express and there was an incident with my shoes. The Babouche shoes I was wearing are now hanging on my wall with plants in them. I made 2 loops out of an old T-shirt and hung them above an antique Berber knife. The shoes are very very common here and are traditional style with embroidery on them, black on black. This little cluster hangs next to the teapot thing from above. Finally, we have the shirt pillow. Simply put, I bought a button-down cropped shirt from the souk and sewed it into a pillow. The buttons go in the back so you can't see them and I just filled it until it was fluffy and firm. If you liked anything from this blog, feel free to pin anything you want onto Pinterest. • Recently, there was a month long carnival/art fair/bazaar that came to town and I decided to check it out. It was actually pretty fun and I found some really great deals when I was shopping. I picked up a 5 piece bamboo kitchen spoon/spatula/doohinkey combo that comes in its own bamboo holder for USD $1.40 Not bad! We hit up the carnival part, too and went on some of the rides--what a trip. Ummm...if you think American carnivals are unsafe, you should really take a look at what goes on here. There was one ride that was similar to "The Orbit" at Six Flags in Gurnee and let me tell you-- I freaked out. The ride itself wasn't that scary, but the "locking latch" mechanism was terrible! Imagine the classic carnival swings but with ski-lift shaped seats instead. Surprisingly, it went really high up in the air and was attached to this rotating crane arm thing. It was so bad I took a picture of it just for you all to appreciate. And if you think the "Carneys" in the states are creepy, well...yeah. I'll leave it at that. Love this little handsome guy! • A few weeks ago, we headed over to good ol Ait Melloul (a city that's inland) and we stumbled upon this old musty garage. In it was an antique car of some sort and it was seriously (insert dramatic American girl accent now) COVERED in dust. First thing Mohamed does is write our names in a heart. So cute...and so dirty at the same time! This just screams romantic, doesn't it? Hahaha! • One of my favorite mosques in Agadir is the one pictured below. This whole time I've been calling it the Leblon Mosque and I just found out today it's actually the Loubnane Mosque. Whatever. TomAYto, TomAHto. • Mohamed brought me this can of "meat" (if you can even call it that) the other day and I was totes grossed. It's allegedly like bologna, except it's pinker and weirder. This might just be Morocco's version of SPAM, but I'm not sure. Like a typical dude, he likes it on everything--grilled cheese sandwiches to omelettes, and even for breakfast. Riiiiight. I'm gonna go ahead and skip it this time. And next time. And every time after that. • Nothing exciting, just a few shots of the fruits and veggies. We picked up the juiciest watermelon ever! It had almost no seeds and was so good. Doesn't it look like it's just gonna start dripping everywhere? • On our way to one of our beach picnics, we stopped at this mosque. I think it's so pretty and the detail and design is far more ornate than the picture represents. Even the stairs are pretty. • On Sundays we like to relax in one of our many favorite spots. We usually go to places that aren't full of people so we can have the whole beach to ourselves. There are quite a few spots that we go to and we pack a full picnic and enjoy the day together. Somehow, he always convinces me to bring a thermos of hot tea (yes I'm serious) and 2 little tea glasses. This particular day, we pulled over and used some straw prayer mats to shade the inside of the car. We were going to eat in the sand, but the cross breeze felt soooo good that we ended up having lunch in there! • I made some fruit salad and thought it just looked so pretty in this Moroccan bowl. Thanks to my Mom and Dad's care package, I have a melon baller here and it definitely gets put to use! • I like this. That is all. Junk Drawer 3.0 coming soon.